Let’s start with the weekly AAII sentiment survey of US retail investors. It shows a rebound in bullishness this week with those expecting the market to be higher 6 months from now at 37.1% (an increase of 7.3% points). The bears decreased from being the majority to just 40.8%. The changes result in an increase in the bull ratio from the slightly bullish 37% to the neutral 48%. While the ever popular AAII weekly survey may give the impression that retail investors in the US are shrugging off May’s weakness the AAII asset allocation decisions say otherwise. According to the latest report, they have sharply reduced their equity exposure by cutting it back from 60% of their portfolio to 51%. What they’ve pruned from stocks, they’ve added to cash and bonds almost equally. Cash allocation increased from 20% to 24% and bonds from 20% to 25%. With the exception of the bond allocation which is at an extreme, the equity and cash allocations provide little insight from a long term perspective. However, in the short term, the shift out of equities does indicate that investors are giving up on expectations for higher prices. This is the pattern of behavior that we normally see at the end of corrections. Had investors instead adamantly kept their long exposure or worse yet, increased it, I would be very nervous. Usually the AAII asset allocation in equities shadows the S&P 500’s performance. The recent drop in allocation for equities however, is an asymmetrical response to the recent decline in stock prices which suggests the average retail investor is feeling a good amount of fear. In the past we’ve seen only two other similar drops in equity allocation and they’ve both been good intermediate buy points. The gauge of newsletter editors sentiment is basically unchanged from last week with 39.8% bullish and 28.4% bearish. This increases the bull bear ratio ever so slightly from 1.35:1 to 1.40:1. Otherwise, we have a relatively oversold condition which corresponds to levels that we saw at the February 2010 lows. American’s feelings towards their finances crept a little bit closer to the high established earlier this year in January. But for the most part things are still rather gloomy. This week’s CCI is at -44 which means that it is the worst consecutive length of time (137 weeks) below its long term average than the early 1990’s (187 weeks). As the annotated chart above shows, the faith of the majority of investors in fixed income is misplaced. As we’ve been watching for some time now through the fund flows data (see below) and the recent shift in asset allocation (from AAII) into bonds, I can’t help but reiterate what I’ve been saying for some time, today’s bond investors will be disappointed. The survey of active managers this week showed a continuing reluctance to “buy the dip”. Last week I shared with you the chart of the median survey results, below you’ll find the NAAIM mean or average survey results. Active managers were on average less bullish than even last week pushing the mean to 27.5%. This means that on average active managers surveyed have positioned slightly more than a quarter of their portfolios long. This is a departure from early April when they were 86% long but it is still not equivalent to the February 2010 lows (22%). 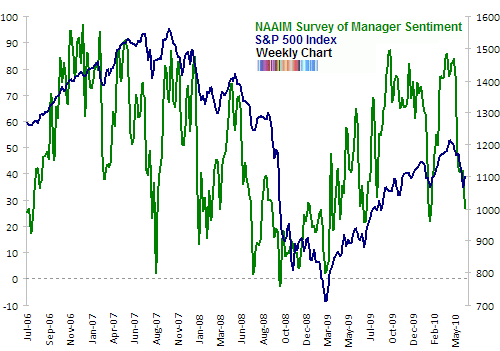 While sentiment is still not at or below February levels, it is important to note that the S&P 500 index is little changed from May 19th when the NAAIM average was 40%. So we are seeing a slow continuing capitulation, even as the market thrashes within a small range. For those keeping track, the median NAAIM was once again 27.5% this week, a decline of 67.5% points from early April. According to a recent report from McKinsey equity analysts have been and continue to be ever optimistic (link, requires registration). The report concludes that during times of economic growth analysts’ estimates are optimistic but more accurate since reality matches their expectations but during contractions they remain optimistic and increase the gap between reality and estimates. Alan Newman of CrossCurrents reports that analysts today are as optimistic on the Nasdaq 100 stocks as they were in March 2008. As of mid-May, 77.7% of the recommendations were “Buys” and a paltry 3.6% were “Sells”. In March 2008, 74.1% of the recommendations were “Buys” and 2.9% were “Sells”. None of the Wall Street sell-side strategists surveyed by Bloomberg has decreased their year end target for the S&P 500 index. Since the start of the year, 8 out of the 13 have increased it. The average target is 1268 or a 19% increase from now until the year end. None of the strategists have a target lower than the current level. The least bullish strategist is Citi’s Tobias Lekovich with a target of 1175 or an 8% increase from Friday’s close. Personally, neither of these two data points really bothers me. The nature of both vocations is such that it would require the arrival of the four horsemen of the Apocalypse on the horizon for their optimistic faith to be shaken. The “flash crash” sent a panic through Mom and Pop investor. According to ICI retail investors in the US withdrew more than $23 billion from domestic equity mutual funds last month. This is the largest single drawdown since October 2008. Since January 2007 mutual fund investors have withdrawn a net cumulative total of $230 billion from domestic equity funds. Mutual fund investors also withdrew $6 billion from foreign equity funds (not shown in above chart). This reverses the trickle of positive inflows that these funds were seeing and is the largest single month withdrawal since March 2009. Bond funds, the favorite asset class by far, also saw a drastic decline with only $17 billion inflows. Since January 2007 bond funds have received cumulative net inflows of $650 billion. 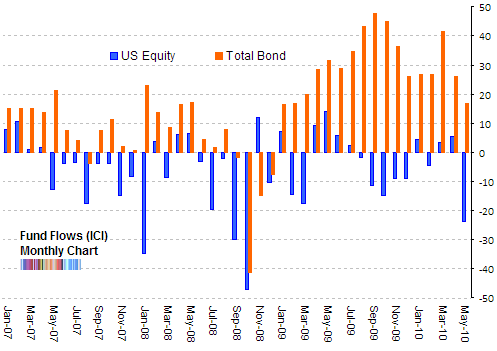 According to TrimTabs, US equity mutual funds saw their 5th largest monthly outflow in May with $30 billion withdrawn. The next biggest outflow was in September 2008 ($34 billion). After that it was January 2008 ($36 billion), October 2008 ($47 billion), and July 2002 ($49 billion). 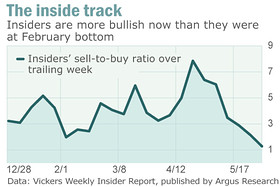 Vickers Weekly Insider reports that corporate insiders are more bullish today than they were at the end of the correction in February 2010. Back in mid-April insiders were selling 7.83 shares for every 1 they were buying. Last week in contrast, they were selling just 1.26 shares for every 1 they were buying. Since corporate insiders are predominantly sellers, when the ratio is close to or at par, it corresponds to low stock prices. The fact that insider selling has dried up recently is no guarantee that stock market prices will be higher but it does help to know that those who are considered to members of the “smart money” are reluctant to sell shares at these prices. Last week we looked at the installation of gold dispensing ATM’s in Abu Dhabi. So this week we must note that May was a gangbusters month for the US mint. It sold 190,000 gold coins -the largest amount in over a decade. 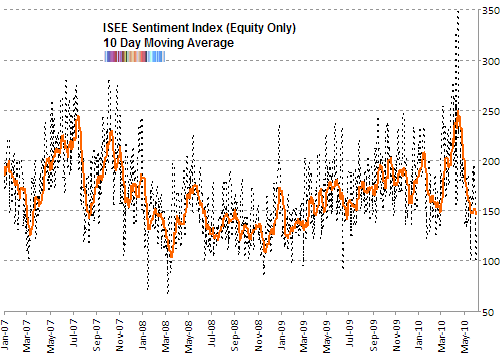 But there was one interesting data point on Wednesday (June 2nd, 2010); while most equity market averages were higher by more than 2% the ISE Sentiment index fell to 100. While it was only one day’s worth of data, this was a surprising amount of skepticism on a very positive close. I look forward to reading your recaps on sentiment. Quite the appropriate metaphor for sell siders, they constantly look for fresh ways to groom swine to look fine, and IPO’s are a tough sell. this is excellent info…please keep up the great work !!! 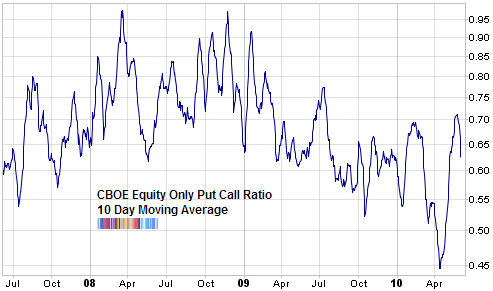 Do you follow the OEX option traders put/call ratio ? These are the “expert” option traders whom history has shown to be mostly correct. Of particular interest is the OEX open interest put/call data, which seems to more accurately reflect their current thinking. Another interesting and usually accurate reading adds the ISE sentiment index calls/puts to the OEX open interest puts/calls. The 15 DMA of this reading is currently about 180 (lower is bullish), about as low as it’s been in the last year. This reading was in excess of 300 in mid 2007. Wes, yes I do keep an eye on the OEX. Next week I’ll see about showing a chart. Thanks the heads up on that as well as the ISE’s OEX ratio.